"A girl's gotta eat!" quips Jaden Hair, self-taught cook, creator of the popular food blog Steamy Kitchen, and most recently, author of The Steamy Kitchen Cookbook. This is the kind of sass and practicality that makes Jaden's work so enjoyable and relatable. 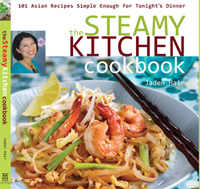 Her new book is dubbed, "101 Asian Recipes Simple Enough for Tonight's Dinner" and features fast, simple, and delicious recipes passed down from her mom and inspired by her fellow food bloggers. I first met Jaden at the BlogHer Food conference a few months ago, and was struck by her focus, drive, and of course, her sparkling personality. Judging from her expansive multi-media reach (Jaden is workin' it -- not only does she have a blog and book, she also writes a weekly column for the Tampa Tribune and has a syndicated show on Tampa Bay's CBS10), it's hard to believe that she's only been at this whole food thing for 2 ½ years. (Other than feeling a little bad about myself) I find inspiration in her hustle. It was a pleasure chatting with Jaden, and I found myself nodding and smiling as her enthusiasm flowed through the phone line. It wasn't until she moved away from California to a suburb of Tampa, devoid of good Asian markets and her mother's home cooking, that Jaden learned to cook. She earned her culinary degree via a $448.63 cell phone bill, and when I read her dedication on the front page of her book ("To my Mom, who spent thousands of hours reciting family recipe over the phone...and to my Dad, who patiently translated when our Chinglish didn't suffice. "), I was reminded of my own inadequate Chinglish...and all the times I called my own mom from the grocery store, or begged her to just estimate how much soy sauce/rice vinegar/black bean sauce she used in a dish so I could piece together some semblance of a recipe. Below is a recipe for Firecracker Shrimp, straight from The Steamy Kitchen Cookbook. It is a recipe that has become a regular at Jaden's dinner parties, and she warns, they rarely make it to the table because guests stand in the kitchen snagging them as they cool on the rack. The recipe is originally from Rice and Noodles by Mae Gabriel, a blog that inspired Jaden to take food photography seriously. A good indication of the other dishes in The Steamy Kitchen Cookbook, these Firecracker Shrimp are enticing and accessible. And, I'm fairly certain they won't be making it past the cooling rack at my next party either. 1)	In a small bowl, mix the cornstarch with the water to make a slurry. 2)	Lay the shrimp flat on a cutting board and using a sharp paring knife, cut a few nicks on the inside curve of the shrimp. Be careful not to cut through the shrimp. Pat the shrimp very dry. 3)	Season the shrimp with the salt and pepper. Pour ¼ cup of the sweet chilli sauce on a small plate. Hold the shrimp by its tail and dip both sides of the shrimp in the sweet chilli sauce. Avoid getting the tails wet (if the tail of the shrimp is wet with marinade, it will splatter in the hot oil). Let the shrimp marinade for 10 minutes at room temperature. 4)	Use paper towels to pat the shrimp slightly, to soak up the extra marinade. Some of the sticky sweet chilli sauce should still be on the shrimp. 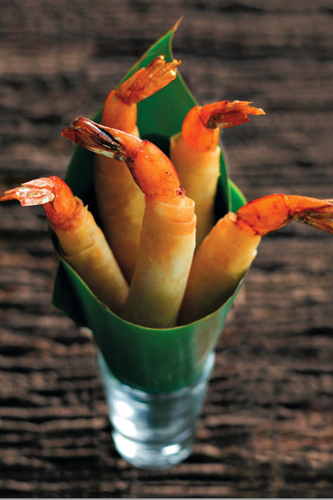 5)	Roll the shrimp in the halved wrappers, following the instructions below. 6)	In a wok, deep fryer or large sauté pan, add 1 ½ inches of oil and heat it to 375 degrees F. Add the firecracker shrimp a few at a time to the oil and fry until golden brown on each side, about 3 minutes. Drain on a baking rack and serve with a side of sweet chilli sauce for dipping. Option: Add a thin slice of mango with the shrimp with wrapping to make Firecracker Mango Shrimp. 1)	Lay an eggroll or spring roll wrapper on a dry, clean surface as shown. Lay a shrimp with the tail sticking out. 2)	Bring the left corner of the wrapper over the shrimp and being rolling left to right. Make sure that you are rolling tightly. As you roll, bring the top corner o the wrapper down and over the shrimp. Again, make sure you leave no open pockets of air. Big air pockets and holes will allow oil to seep in. 3)	Continue rolling towards the right. Dip your finger or a pastry brush into the cornstarch slurry and pain the final corner. Roll to seal. Lay the roll seam side down on a dry plate or tray. Repeat with the rest of the shrimp and wrappers. Keep all uncooked Firecracker Shrimp covered with plastic wrap or barely damp towel.